Washington’s Jaylen Nowell dribbles downcourt as Gonzaga’s Zach Norvell Jr. watches on the ground during the Zags’ 81-79 home win on Wednesday at the McCarthey Athletic Center. There were no euphoric screams or celebratory hugs. There was no midcourt mobbing or iconic moment. If there were ever a defeat for Husky fans to cheer, that was it. Rarely has falling short signified how much a program has grown. 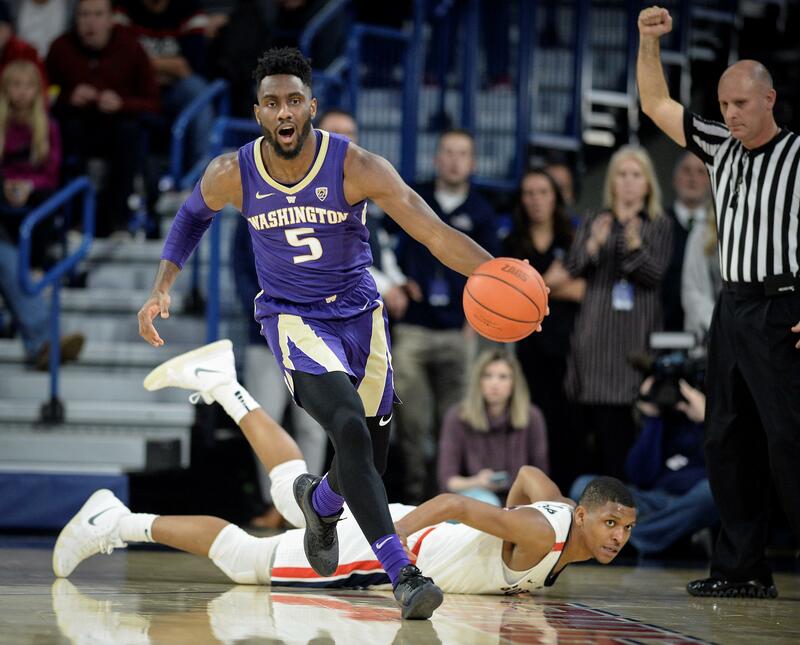 The Huskies walked into McCarthey Athletic Center as 15.5-point underdogs. You have to wonder if that line assumed a late charge by Washington during meaningless minutes. The first part of the second half may have been the Huskies’ best stretch since they beat Kansas last year. They erased a 13-point deficit in less than 5 minutes and took a three-point lead 44 seconds later. David Crisp and Matisse Thybulle slithered their way to the line. Noah Dickerson powered his way there. Nowell and Hameir Wright knocked down key 3-pointers. Most impressive, Washington (6-3) held the No. 2 offense in the country to two points for the first 5 1/2 minutes of the second half. If Washington could have hit any one of the open 3s it saw on any of its next three possessions, the crowd noise may have gone into negative decibels. But then it appeared that order would be restored. The Zags took a five-point lead on a Hachimura layup with 12 minutes left. They took an eight-point lead on a Josh Perkins 3-pointer with 7 minutes left. When they went up by 11 with 5:26 to go, it seemed the only suspense would be whether they’d hold Washington to 68 points so fans could get their 68-cent medium pizza from Pizza Hut. Published: Dec. 6, 2018, 2:02 p.m. Updated: Dec. 6, 2018, 5:49 p.m.